The third studio album from Finland's Sentenced captures a band hitting its stride. 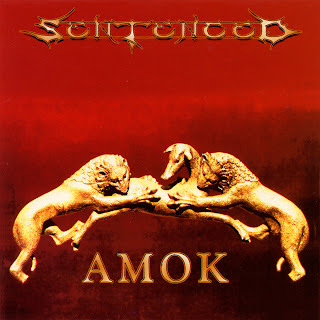 Amok is filled with melodic death metal played in an optimistic tone, the pace upbeat and the compositions moving towards a mature complexity. Amok is a proper group effort, Sentenced avoiding moments of individual showmanship in favour of all the band members rowing in the same direction. The gravelly vocals of Taneli Jarva complement the steady guitar work of Sami Lopakka and Miika Tenkula, producing weighty, melody-powered metal. When Sentenced find the perfect groove, the results are brilliant. The stellar track on Amok is Nepenthe, a confident display of grand instrument arrangements featuring acoustic and electric guitars, an inescapable but restrained hook and imaginative backing vocals. Funeral Spring delivers a devastating riff with the density of osmium, just slightly let down by limited development of the man theme. There are a few weak spots on the album, including some flat backing vocals on Forever Lost, mixed, probably intentionally, way to the back, while Dance On The Graves (lil' siztah) may have had good intentions but sounds a lot like a throwaway track. But the good overcomes the poor, and the album features strong bookends, opening with the middle-of-the-battlefield The War Ain't Over!, a high tempo sonic assault built on tight delivery, and ending with the relaxed instrumental The Golden Stream Of Lapland, where some harmonious guitar solo work finally comes to the fore. Far from running Amok, the album is a controlled display of good metal from early adapters of the melodic death genre. Recorded and Mixed by Ahti Kortelainen.